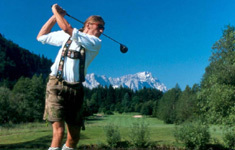 Welcome to Bavaria’s Golf Courses! All golfing enthusiast, beginners and advanced players, will find a warm welcome at Bavaria’s golf courses. Golf hotels offer attractive package deals, including the green fees for various golf courses of the area. For beginners, there are several high-quality golf schools. Golf has overcome many old prejudices and is now a sporting trend. Golf is only for old men? A fallacy - 40 per cent of all golfers are women and more than half of the people playing golf are younger than 49. Golfing is very expensive? The annual expenses of an active skier or gym member are with an average of 600 to 650 Euros higher than those of a golfer, who spends about 500 Euros for his equipment, including clothes and shoes. And it’s also an investment in your health. Doing an 18-hole course you move 124 muscles and you use up 1,200 calories – that’s more than you use up in one hour jogging or two hours tennis. (Source: DGV, January 2002). Don’t hesitate any longer: go there and tee off! You will find a map of all golf courses in Bavaria and direct links to their individual internet pages on the website of the Bavarian Golf Association.